Competitive Eater, David “Hungry Bear” Haines came all the way from Brisbane, Australia to take on The Dons Pizza Challenge! He barely squeezed in the last bite before the 20 minute time was up! We’re looking for other competitive eaters out there to step forward and take on The Dons Pizza Challenge! The answer, of course, is a resounding and emphatic Yes. There’s everything to like. Charity. Dignity. Opportunity. Community. Human beings helping each other, wanting in return only a mutual realization of success and sense of purpose. That’s the goal of The Dons’ Wood-Fired Pizza in the Cascades Marketplace in Sterling, Virginia, which hosted its annual Serve-N-Sign Nov. 30 featuring seven current and one former Washington Redskins football players serving up piping hot pizza slices, pouring cold drinks and happily chatting with hundreds of star-struck burgundy-clad customers. The evening generated more than $3,000 in proceeds to directly benefit the Open Hearts Foundation, a locally based outreach charity which seeks to serve the needs of underprivileged and at-risk youth across Loudoun County, as well as providing educational and technological support to poverty-stricken regions of Africa. 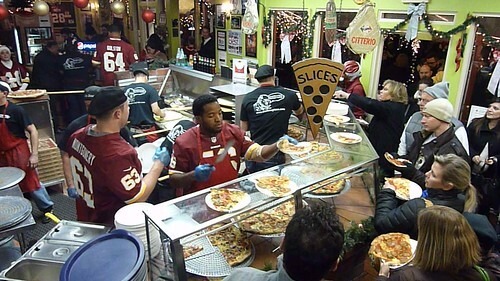 Some 920 pizza slices were handed out to more than 300 hungry visitors, who braved the nipping cold and drizzling rain for the chance to be served by their heroes. So much to like. Captain Kirk was among the event’s guest celebrities, dishing up pizza and giving broad smiles to his many adoring fans. He took a moment to answer his own hypothetical question. 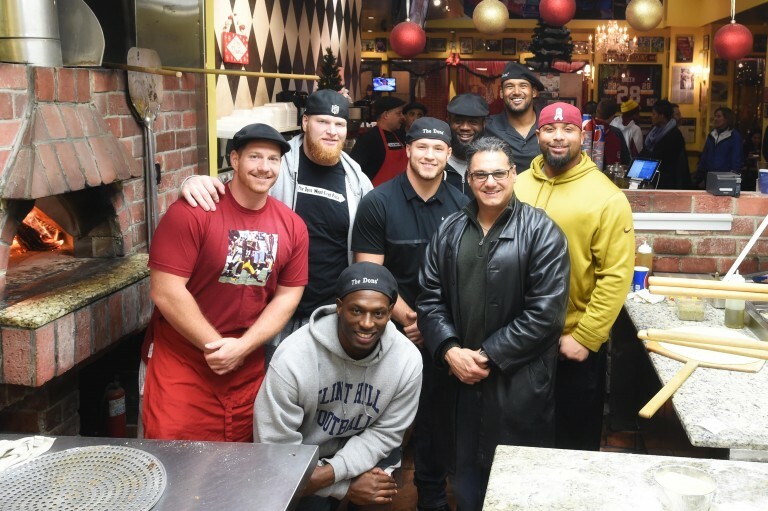 The quarterback was joined behind the counter by teammates Kedric Golston, Frank Kearse, Nick Sundberg, Will Compton, Trent Murphy, Adam Hayward and former teammate Rocky McIntosh, now on the football staff of Oakton’s Flint Hill School. Several of those guys are frequent volunteers at The Dons’ Serve-N-Sign event; a few were first-timers. “Hey, how you doin’? Come on over!” exclaimed Cousins excitedly to one fan he recognized. The Skins even mustered up politeness for the poor fellow in the New York Giants windbreaker. 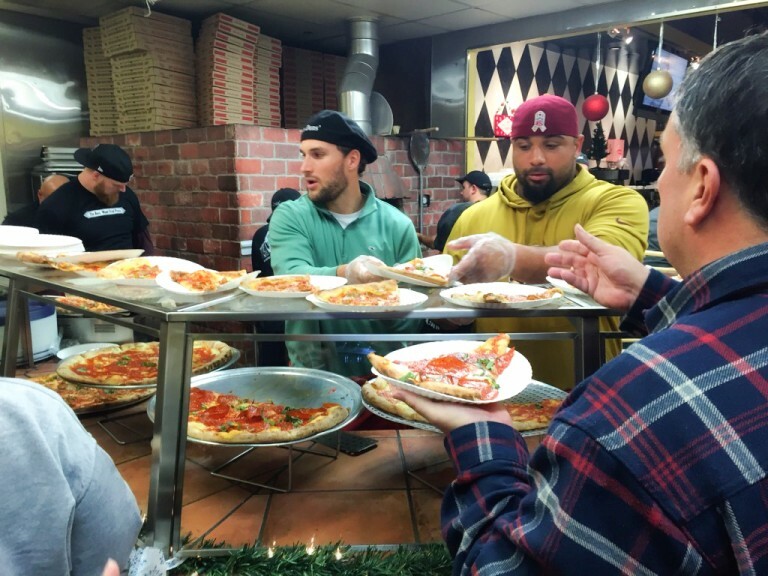 Golston has worked with The Dons’ charity event every single year since the pizzeria’s owner, Waleed Zarou, first held it. 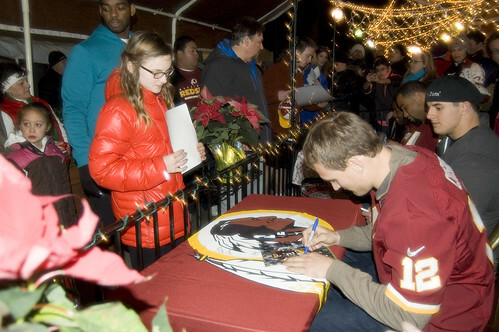 He has been instrumental in bringing fellow Redskins with him to the delicious charity benefit. Zarou has become friendly with several Redskins since initiating the event almost a decade ago. He expressed his appreciation for the players lending their time and their notoriety to aid the cause of Open Hearts. “I think it speaks to their character, the caliber of men they are, using the platform they have to reach the community,” the business owner said. “They don’t have a lot of time during the season, but they take it as a serious responsibility and do right by it. You can talk about doing something, but actions speak louder than words. They demonstrate by their actions that they care, they care enough to come out to this little pizza place in Loudoun County and give two hours of their time. 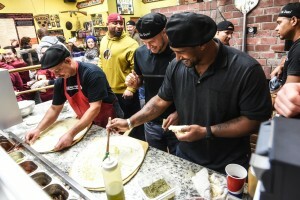 After an hour of dishing up The Dons’ unique wood-fired pizza topped with choice of meats or vegetables, the professional athletes adjourned to a long table out the restaurant’s side door where a parade of fans sought autographs and a snippet of conversation. The Dons’ event also included a raffle promoting many of the services and products of its sponsors, such as Gold’s Gym, i9 Sports, Dulles Golf, Giant Food and Sportrock Climbing Center. The event is an extension of Zarou’s personal Christianity-guided philosophy. A deacon at Sterling’s Calvary Temple Church and a chaplain under the guise of the International Fellowship of Chaplains, he is a veteran of charitable causes in war-torn regions of Central and South America, and personally delivers computer and other equipment to villages in Kenya, supporting schools and training programs. Closer to home, Open Hearts works with local governments to reach kids at increased likelihood to become involved in gangs, drugs and other criminal or dangerous activity. Open Hearts is a non-profit 501(c)3 charitable organization run entirely by volunteers and seeks to help children realize better lives, whether locally in Loudoun or globally in Africa. It was begun by Zarou and fellow entrepreneurs Tony Schwartz and Danny Johnson. Zarou noted the smiles on the faces of kids streaming through the pizza line, getting to look in the eye the same players they’d admired on TV. Preparations for next year’s event at The Dons’, including retaining sponsorships from vendors, requisitioning a football signed by the Redskins team and extending invitations to other players and local celebrities, are already underway. With the Washington Redskins struggling with a less than stellar record, it isn’t necessarily providing much hope on the field during the holiday season. But off the field, players are still taking advantage of every opportunity to give back to the fanbase that has supported them unconditionally. A fine example of this was evident at The Dons’ Wood-Fired Pizza in Sterling on Dec. 17, as several players were on hand to serve free pizza and sign autographs. 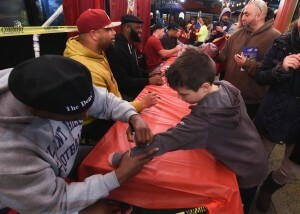 Hundreds of fans showed up on a chilly night to eat some tasty, albeit free pizza while also getting the chance to interact with the players that are shown on their televisions on Sundays. 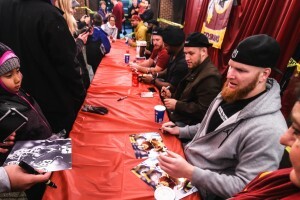 Kerrigan, Alfred Morris, Will Montgomery, Kedric Golston, and Kirk Cousins were all in attendance. Waleed Zarou, the manager of The Dons’, has been running this specific event for five years now. It all started with a strong friendship between Golston and Zarou, who said they gave out a record number of pizzas this year. This year, the event was designed to support the Open Heart Foundation, an organization that Zarou and fellow businessmen have been running for about a year. The foundation’s mission is to continue to develop an educational system as well as a church system in western Africa, a place Zarou has been visiting for 14 years. 40 churches have already been established and a K-through-12 schooling system has been put in place. While that project is a work in progress, the immediate goal of providing Redskin fans with a memorable event was a clear success. For players like Morris, who has been at nearly every charity event this season, it means a lot to interact with the fans that wear his No. 46. Now through Christmas, we’re running a special promotion at Costco! Purchase Two $25 dollar value gift cards for only $29.99. Cards are available at the Sterling, Leesburg, and Chantilly locations.